Greek Cyprus, Israel and Greece must forge deeper military ties to improve security and more effectively counter common threats in a turbulent region, the countries' defense ministers said Friday. 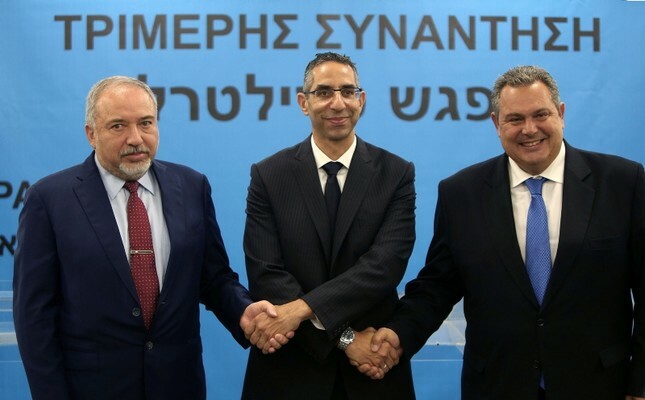 Greek Cypriot Minister Savvas Angelides and his Israeli and Greek counterparts Avigdor Lieberman and Panos Kammenos said they also seek to expand cooperation on cybersecurity, joint military drills and search and rescue operations in the eastern Mediterranean. The Israeli defense minister said the threat of terror attacks and the challenges posed by illegal migration in a region he called "an ocean of violence" where "rogue states" operate must be met collectively. "It's much better to counter regional threats together," Lieberman told a news conference. He also said Israel will host the ministers' next trilateral meeting. The ministers also hailed the first conference bringing together Greek Cypriot, Greek and Israeli companies active in the military industry. The Greek minister also said a eurozone decision paving the way for Greece to end its eight-year bailout program will positively impact the country's armed forces. In a clear reference to Turkey, the Greek Cypriot minister said closer defense cooperation poses no threat to any other country and helps secure the ongoing search for gas in the eastern Mediterranean. Greek Cyprus and Israel have discovered gas deposits off their coasts and continue searching for more. By unilaterally declaring an exclusive economic zone and granting licenses to international energy firms without due consideration of the rights of the Republic of Turkey and Turkish Cypriots, the Greek Cypriot administration is trying to usurp Turkey's territorial rights. But the international maritime law allows Turkey and the Turkish Cypriots to exercise their rights in the region. According to the law, national territories have a continental shelf up to 200 miles while the islands have territorial waters extending up to 14 miles. The disputed 6th Block, for instance, falls within the limits of Turkey's 200-mile continental shelf. The island of Cyprus has been divided since 1974, when a Greek Cypriot coup took place after decades of violence against the island's Turkish community and Ankara's intervention as a guarantor power. It has seen an on-and-off peace process in recent years, including the latest initiative in Switzerland under the auspices of guarantor countries Turkey, Greece and the U.K. that collapsed in 2017. The inability to ensure peace and stability in the governance of the island leads to dispute over the share of natural resources. The Greek Cypriot government says any potential hydrocarbon wealth will be equitably shared after a reunification deal is reached.